Pack of 100 Queen Charlotte Type with elastic bands. Lightweight 2 ply paper, elasticated ear loops, dispenser box, latex free. 100 per box. 4p per glove. 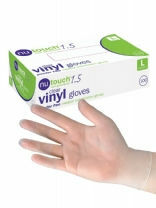 Nutouch 1.5 New Generation Clear Vinyl Medical/Surgical Gloves Contains no natural rubber latex and offers extra protection against certain chemicals. 100 per box. 100 Per Box. Cost per glove =4p each. Single use. 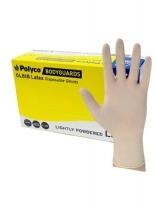 Hand Safe Latex Examination Gloves - Powder Free. Compliant with the medical devices directive 93/42/EEC and European Standard EN420. 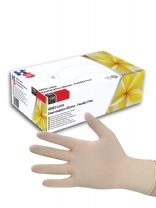 Disposable gloves 100 per box, lightly powdered. contains natural rubber latex. 4p per glove. Pack of 50. White. 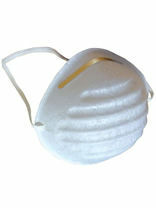 Dust mask with elastic band. 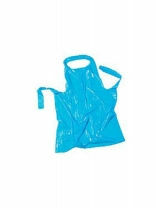 100% polyester material and provide good filtration efficiency. 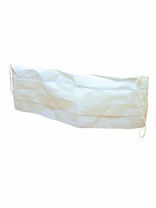 Polyester elasticated head band. 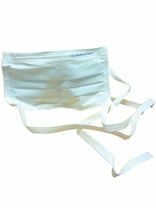 Flexible, external aluminium nose band, allows closer filling. 200 per box. Cost per glove= under 4p each. 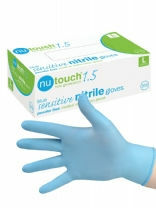 Nutouch 1.5 Blue Sensitive Nitrile Powder Free Medical Gloves have been specifically designed to provide a supple thin film barrier that enhances dexterity and sensitivity. 200 Per Box. Pack of 50. Natural rubber, latex free. Tie-on. Pleat style with ties. Blue, Single use. Protective three-layer construction. EN14683. 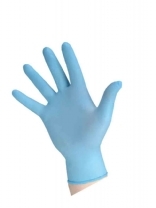 DLT supply a range of powdered and non-powdered, latex, vinyl and blue nitrile gloves.